Alexander Gordin, Bogdan Belgorodsky, Boaz Seemann, Michael Gozin and Alexander B. Fialkov, School of Chemistry, Tel Aviv University. Chemical reactions are typically involved with mixing the reactants together in an appropriate solvent, often with addition of a catalyst, and allowing them to undergo a reaction, which may take from couple of minutes to few days. The progress of the reaction is either assumed or monitored most-commonly by thin layer chromatography. However, little or no information is obtained on-line on the reaction actual progress and its yield. At the perceived end of the reaction, the products are separated and purified by preparative chromatography, distillation, sublimation, selective precipitation or crystallization, processes which may take several hours or even several days. Subsequently, the purified products are analyzed by 1H and 13C NMR and by high resolution mass spectrometry (often Quadrupole Time of Flight (QTOF) mass spectrometer), typically via flow injection electrospray ionization (FI-ESI). Yet, while FI-ESI-QTOF provides elemental formulas information, it does not provide information about the synthesis yield, products purity, availability of isomers and on the reaction mechanism, since the already-purified compounds are analyzed and since ESI has non-uniform, highly compound dependent ionization yields. 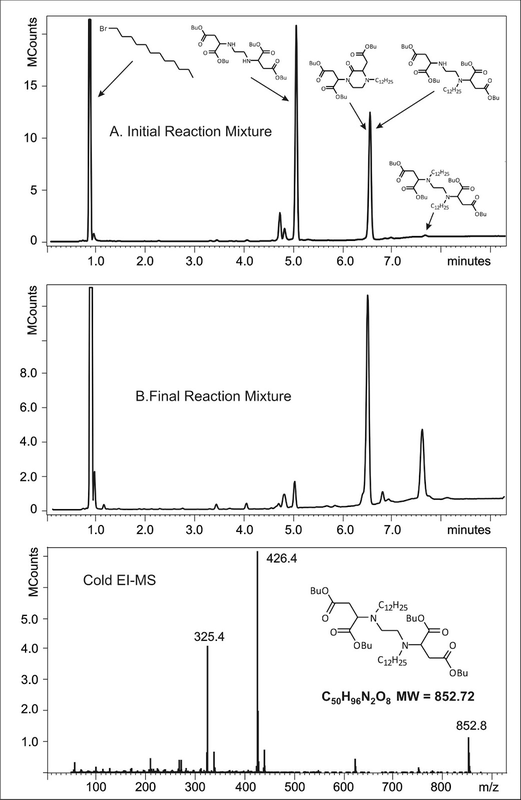 In order to alleviate the above mentioned shortcomings of organic synthesis, we used the Aviv Analytical 5975-SMB GC-MS with Cold EI for semi-on-line monitoring of organic chemical reactions for obtaining information on the reaction products identity and purity and for mechanism elucidation and reaction yield optimization. The 5975-SMB was used with reaction mixtures without their prior separation and purification as required for NMR analysis, thereby saving time and effort. Our unique 5975-SMB GC-MS with Cold EI is based on GC interface with the MS with supersonic molecular beams (SMB) and on the ionization of the sample molecules during their axial flight through an open electron ionization ion source as vibrationally cold molecules (hence the name Cold EI). GC-MS with Cold EI was demonstrated to significantly extend the range of compounds amenable for analysis, practically always giving molecular ions, enabling effective fast GC-MS analysis and providing elemental formulas via isotope abundance analysis with unit mass resolution quadrupole MS. In addition, it uniquely provides uniform response to all compounds, a feature which is vital for the measurement of chemical reaction yields. Keep reading to find out how the Aviv Analytical 5975-SMB GC-MS with Cold EI can change the way organic synthesis is performed via enabling semi on-line monitoring of the progress of organic reactions and via the provision of information on the reaction mechanism, products identity and purity and the chemical reaction yield for its optimization. As is well known, Electrospray ionization and APCI suffer from highly non uniform response. Thus, in LC-MS the mass chromatogram peaks do not provide quantitative information on the amount of sample without sample specific calibration curves. In contrast, GC-MS with its standard electron ionization (EI) has for volatile compounds approximately uniform, semi-quantitative ionization yield. However, standard EI provides molecular ions only for about 50% of the compounds having molecular weights above 300 amu and standard GC-MS is limited to volatile and thermally stable compounds only, which severely restricts its applicability. Furthermore, ion source degradation and peak tailing erode the standard EI response uniformity for semi-volatile compounds. We used the Aviv Analytical 5975-SMB GC-MS with Cold EI to enable semi-on-line, monitoring of reacting compounds and products mixtures. Cold EI is the electron ionization of cold molecules in supersonic molecular beams (SMB). 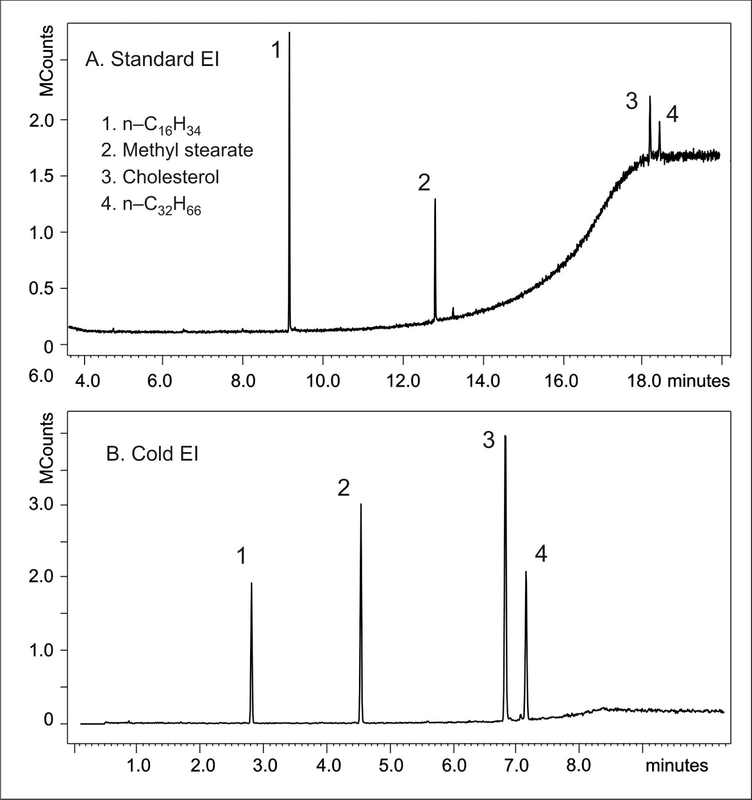 The technology of GC-MS with Cold EI is reviewed by A. Amirav, A. Gordin, M. Poliak, and A. B. Fialkov, J. Mass Spectrom., 43, 141-163. (2008). The later paper is available upon request. The basic requirement from a system that should measure reaction yields is that its response will be uniform and compound-independent so that the mass chromatogram peak percentage report can serve to calculate the reaction yield. Electron ionization, unlike any other ionization method, uniquely provides ionization yields that approximately depend on the number of electrons in the molecule which relates to its molecular weight. Thus, the electron ionization probability for organic compounds approximately linearly increases with the ionized compound's molecular weight hence it is approximately proportional to the sample weight. Consequently, it is well known that standard GC-MS exhibits uniform response to all volatile compounds found in analyzed samples. For GC-MS analysis that is based on a quadrupole mass spectrometry, the ionization yield is further reduced by the mass analyzer and ion detector transmission, hence its response slightly declines with mass. However, for semi-volatile and low-volatility compounds, ion source related peak-tailing and degradation at the ion source active metal surfaces can significantly reduce the observed signal, sometimes in a difficult to predict way, thus the feature of uniform response of standard GC-MS is eroded and often does not exist anymore. In contrast, in GC-MS with Cold EI, ion source-related peak-tailing and degradation are completely eliminated, due to the use of a fly-through ion source, thus providing practically uniform compound-independent response for all analytes that enter the SMB. The implication of such uniform response is that in a given chromatogram, the peak-area relates to the amount (weight) of the analyte. 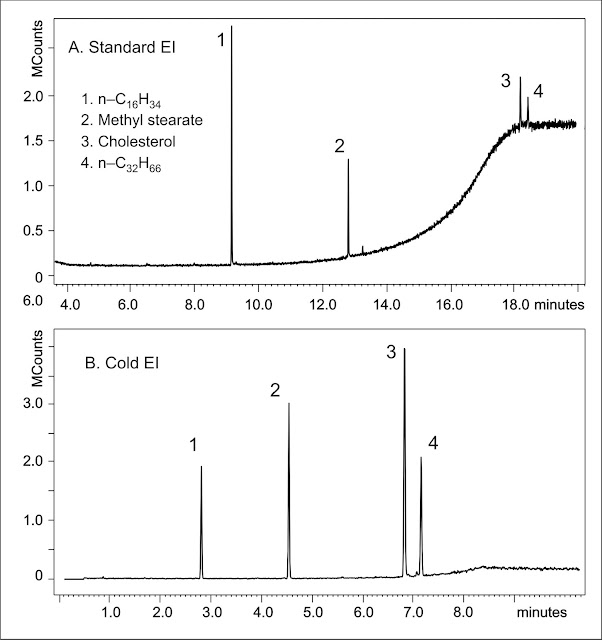 In Figure 1, the uniform response of the Aviv Analytical 5975-SMB GC-MS with Cold EI is demonstrated via the comparison of two chromatograms of the same test mixture that included n-C16H34, methyl stearate, cholesterol and n-C32H66, each at 0.25 ng on-column amount (n-C32H66 amount is somewhat lower). As clearly observed (and well known), the response of standard EI is declining with the sample volatility and mass, and already for cholesterol its relative response has declined by an order of magnitude in the total ion count scale (TIC). In contrast, the response of 5975-SMB remained unaffected by the sample volatility due to the use of contact-free fly-through ion source and it is similar to that of GC-FID. In addition, all the four sample compounds had dominant molecular ion in their Cold EI mass spectra while for standard EI it was either weak or absent in the case of n-C32H66. Thus, the uniform response of GC-MS with SMB can be assumed and routinely used for semi-quantitative analysis. Figure 1. The analysis of a mixture of n-C16H34, methyl stearate, cholesterol and n-C32H66 at about 0.25 ng on-column amount with standard GC-MS (upper trace) and 5975-SMB GC-MS with Cold EI (bottom trace). 30 meters, 0.25 mm ID capillary column with 0.25 µ DB-5ms UI column was used with the standard GC-MS with 1.2 mL/min column flow rate while only 5 meters of that column was used with 5 mL/min column flow rate with the 5975-SMB GC-MS. The GC oven program started at 80ºC followed by 10ºC/min to 320ºC for the standard 5975 GC-MS and 50ºC followed by 30ºC/min to 300 ºC for the 5975-SMB. Figure 2. Synthesis of X5. Reagents and conditions: (i) SOCl2, n-BuOH, 0 ° -> 60°C, 24 h; (ii) dodecylbromide, K2CO3, CH3CN, 80°C, 48 h; (iii) KOH(aq), THF, RT, 24 h.
included conversion of S,S-EDDS into a corresponding tetrabutylester X1 (C26H48N2O8; m/z 516.3), which was subsequently subjected to bis-N,N’-alkylation, giving the key intermediate X2 (C50H96N2O8; m/z 852.7) that was finally hydrolyzed into the target tetraacid. However, significant challenges in the synthesis, purification and analysis of the key intermediate X2 were encountered during the development of the second step of the process. Under many reaction conditions, formation of substantial amounts of mono-N-alkylated tetraester X3 (C36H72N2O8; m/z 648.5) and lactam X4 (C34H62N2O7; m/z 610.5) side-products were observed as measured with the 5975-SMB (Figure 3). In attempt to find which conditions, including various solvents, alkylating agents, bases, reagent concentrations and temperature regimes, would lead to a minimum amount of side-products, all evaluated reaction mixtures were monitored by the 5975-SMB GC-MS with Cold EI, since standard GC-MS was incapable of analyzing our relatively large and polar starting materials and products while FI-ESI-QTOF is incapable of providing any quantitative information on the reaction progress. Figure 3. The analysis of chemical mixture by the 5975-SMB GC-MS with Cold EI. X2 (C50H96N2O8 (m/z = 852.8)) is the target reaction product and it is the last to elute total ion chromatogram peak (upper and middle mass chromatograms) whose cold EI mass spectrum is shown in the bottom trace. The three main peaks before it are of a reaction "dead-end" lactam plus co-eluting partial substitution product and the two reactants as indicated in the figure. A 15 meters column with 0.32 mm ID and 0.1µ DB1HT film was used with 32 mL/min helium column flow rate and 30ºC/min GC temperature programming rate. For example, under many non-optimized conditions, the target intermediate X2 was assumed to be absent by all other techniques but could be observed at about 0.4% yield (retention time of 7.7 min in Figure 3), even after prolonged heating (5 days) of the reaction mixture (upper chromatogram, Figure 3). We note that while 0.4% is not much it served us well to test various optimization ideas while without the 5975-SMB GC-MS with Cold EI the whole project could have ended without success. It should be further mentioned that despite concerns regarding our compounds stability under prolonged heating, we still found significant amounts of unreacted starting materials, as well as formed side-products, while no products of decomposition could be detected. By screening a large number of possible parameters, we were able to optimize our reaction conditions to the lowest amount of side-products, especially of the lactam X4 (which is a “dead-end” side-product), and obtain the highest yield of the desired compound X2. We found that the best reaction conditions for N,N’-bis-alkylation of the tetraester X1 included use of n-dodecylbromide as an alkylating agent, CH3CN as a solvent and K2CO3 as a base. A temperature of 80°C as well as specific concentrations of the starting materials were also very important for the N,N’-bis-alkylation reaction outcome. 5975-SMB GC-MS with Cold EI analysis showed that at optimal conditions the yield of the X2 is 18% (middle chromatogram, Figure 3). After compound X2 separation and purification by liquid chromatography, the reaction yield was determined gravimetrically and was found to be 18.6%, which is in full agreement with the 5975-SMB GC-MS with Cold EI results (18 ± 3%). 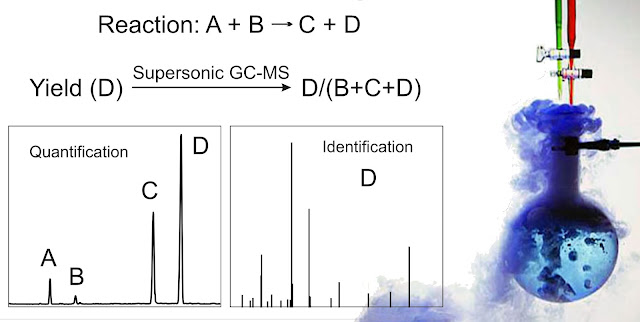 Thus, Figure 3 demonstrates an exceptional ability of the 5975-SMB GC-MS with Cold EI to analyze an extended range of compounds that are well beyond the limits of standard GC-MS. In the 5975-SMB, compounds in the N,N’-bis-alkylation reaction mixture not only eluted, but also had no ion source peak-tailing and/or ion suppression effects, enabling correct determination of this reaction yield. Moreover, Cold EI mass spectrum (bottom mass spectrum, Figure 3) of compound X2 provided a good molecular ion peak, despite the presence of two dodecyl chains, which normally preclude the observation of any molecular ion in standard EI, such as with large phthalate esters. The optimization of the above presented process could not be performed without the 5975-SMB GC-MS with Cold EI analysis, thereby clearly demonstrating that this system can serve as a powerful tool for reaction yield optimization. 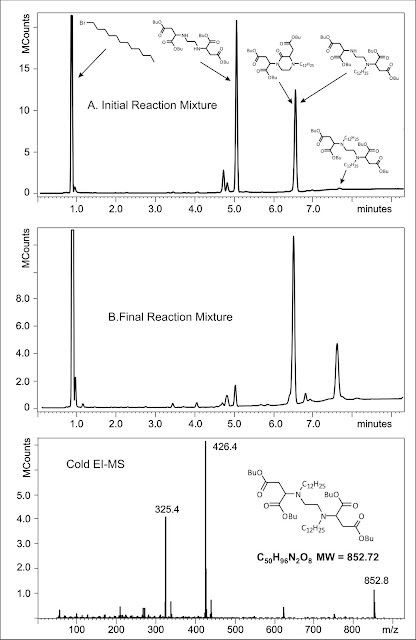 The Aviv Analytical 5975-SMB GC-MS with Cold EI was used for semi-on-line monitoring of organic chemical reactions for their yield optimization, mechanism elucidation and for obtaining information on the reaction products identity and purity. It was used with reaction mixtures without prior separation and purification as needed for NMR, thereby saving time and effort. In this post we demonstrated its application for the optimization of a one organic synthetic reaction. A full description of the use of GC-MS with Cold EI for the optimization of chemical reactions with few examples can be found in A. Amirav, A. Gordin, Y. Hagooly, S. Rozen, B. Belgorodsky, B. Seemann, H. Marom, M. Gozin and A. B. Fialkov, "Measurement and Optimization of Organic Chemical Reaction Yields by GC-MS with Supersonic Molecular Beams" Tetrahedron 68, 5793-5799 (2012). Organic chemistry and other types of synthetic chemistry such as the synthesis of drugs, industrial chemicals and fine chemicals can clearly benefit from online or semi-online reaction monitoring for its improved optimization. Our main goal is to advance a new approach for the performance of organic synthesis that will by-pass the lengthy steps of synthetic compounds separation and purification for their NMR analysis. Accordingly, the synthetic mixture is analyzed semi-on-line for the provision of quantitative content information for the purpose of reaction mechanism understanding and reaction optimization, while leaving the steps of separation and purification to the end after reaction optimization. The 5975-SMB GC-MS with Cold EI is highly suitable for the optimization of chemical reactions since it is uniquely characterized by: A) Having significantly extended range of compounds amenable for analysis due to its use of high column flow rates, short columns and fully inert ion source; B) Having uniform response without any ion source peak tailing; C) Provision of trustworthy enhanced molecular ions to the vast majority of all compounds; D) Being compatible with isotope abundance analysis for the provision of elemental formulas; E) Compatibility with fast and ultra fast GC-MS analysis. Another important side benefit of semi-on-line reaction monitoring is the ability to work in micro scale due to the elimination of the need to purify mg amounts as needed for NMR. As a result, micro chemical reaction reactors can be used for the optimization of the reaction yield with significant time, chemicals and solvent saving (also safer), and only at the end larger reactant amounts can be used as needed for the final product. We feel that when combined these benefits can provide a new approach for improved synthetic chemistry.